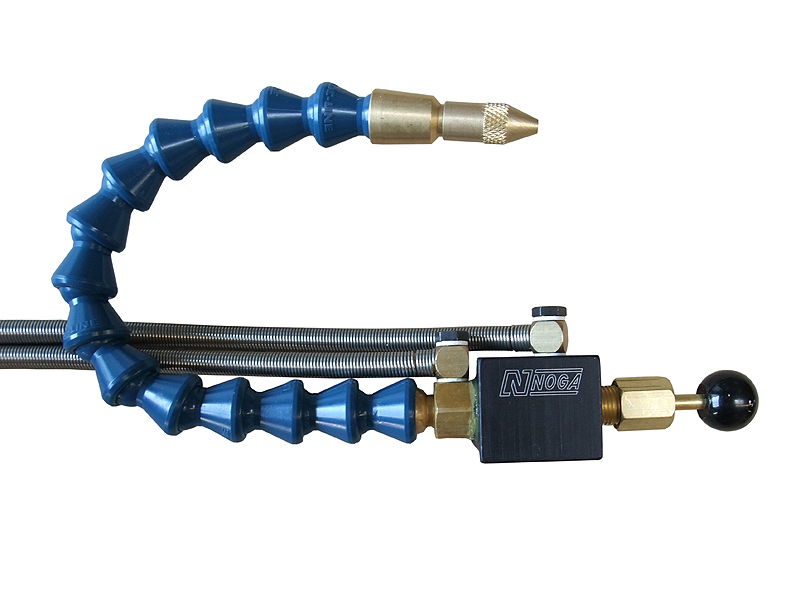 Minimal lubrication / spray mist cooling system for your High-Z and T-Rex machines. Manufactured by NOGA in Italy. Save tool life and get better results when milling metal, stone, or plastic. This universal mist cooling unit rides on the Z axis of the CNC machine. By supplying air and liquid you get a cooling/lubricating effect as well as efficient removal of chips. This will give you better edge quality and improved tool life. There are two models. One is started manually by physically starting the flow of air and liquid. The other has is controlled via an air solenoid that starts and stops the flow of air based on M code commands. If you are using VCarve Pro, these commands are automatically included when you use the WinPCNC post processor. If you are using Fusion 360 or other programs, you may have to select to use a cooling unit in order to get the M code into the tool path. To power the unit you need a small compressor that can give 2 bar (not included with delivery). The hoses are made of stainless steel wire and the side that goes to your liquid container has a filter.